Taking artistry to another level. DivinityHDP by Florida Tile takes artistry to another level. Distinguished by a rich surface of captivating veining, delicate striations, and subtle imperfections of natural stone, this color body porcelain floor and wall tile exceeds even the highest expectations. Inspired by one of the last slabs of Angel Stone extracted from an exclusive quarry in the Italian Alps, DivinityHDP is our interpretation of the divine beauty found in this rare and beautiful sandstone. Four ethereal colors- Dawn, Dusk, Horizon, and Mist, range from a mixture of soft, warm beiges, calm grays and taupes, to a dramatic cool dark gray. All feature monochromatic veining and distinct shade variations throughout. 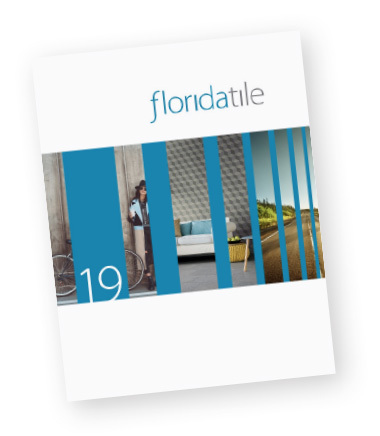 Available in 12x24 and 24x24 rectified field tile formats, this majestic stone look is enhanced with a complimentary collection of 25-piece and random stack mosaics in each color, and a mixed-color hexagon mosaic that incorporates all four colors. A bullnose trim completes this exquisite collection. Manufactured using proprietary HDP—High Definition Porcelain® printing technology, DivinityHDP is appropriate for all applications in both residential and commercial settings. It is entirely made in the USA in our Green Squared® certified Advanced Manufacturing Center in Lawrenceburg, KY, of 40% pre-consumer recycled content. It meets the DCOF AcuTest® requirements to be installed in wet areas and is GREENGUARD® and Porcelain Tile certified. Incorporated into the tile surface is Microban® antimicrobial technology that works continuously to inhibit bacteria growth, improve visible cleanliness, and reduce odors.